Yet another boycott of Driscoll’s products is being called for, by Mexican farm workers this time, echoing a similar call from Washington state workers, as all decry pay and conditions in the fields of Driscoll’s suppliers. A work stoppage began on March 17 in the San Quintín Valley, near Ensenada in the Mexican state of Baja California, as workers, promptly represented by Rúben Núñez from the Oaxaca sección 22 of the Coordinadora Nacional de Trabajadores de la Educación, called for a minimum daily wage of 300 pesos (at about $.067 USD/peso that comes to almost $20/day). Berrymex, one of the largest growers in the area, employing as many as 31,000 workers, is one of the many producers that supplies Driscoll’s with berries. 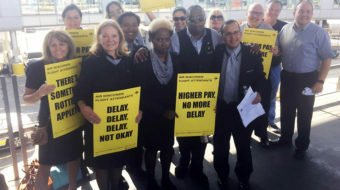 In response to the strike, Berrymex representatives agreed to increase pay for workers by 15 percent, though none have said how much workers would actually be paid under the new scale, instead speaking in terms of percentages. 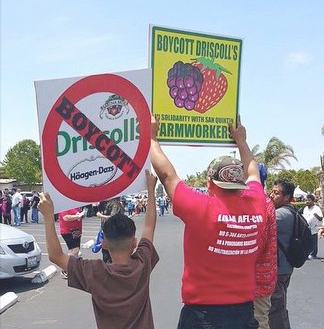 Berrymex, though, is not the only Driscoll’s supplier whose workers are calling for a boycott. Sakura Farms workers in Burlington, Washington, are also calling for a boycott of Driscoll’s products. Ironically, many of the Washington workers are also from Oaxaca, in southern Mexico, and many have family members also participating in the strikes in San Quintín. An Oregon-based NGO, the Fair World Project, has even gone so far as to collect some 10,000 signatures from concerned consumers to present to Driscoll’s, as well as other distributors of the Sakura Farms products. Meanwhile, though Berrymex’s promise to increase pay was enough for many workers to return to the fields, many others have resisted, continuing to fight for more. “Seguimos con los 300 pesos de salario diario, que se pague a 30 pesos la caja de fresa. Se está pidiendo que se paguen los domingos, los días festivos. Todas las prestaciones de la Ley Federal del Trabajo,” Núñez was quoted in Milenio as saying as negotiations continued in Mexicali, the capital of Baja California- demanding not only a minimum daily wage but all the benefits due under Mexican Federal Labor Law. While there were also protests by workers, who blocked the Transpeninsular Highway south of Ensenada leading to as many as 200 arrests, during the initial work stoppage, representatives of the Baja California State as well as the Mexican Federal government have since sat down to negotiate. As negotiations have continued, however, a number of the workers representatives demanded in May that the 18 remaining jailed workers, 14 of which had been held since the original March 17 protests, be released – three of whom were being held on a bail of seven million pesos each, and a fourth on a bail of 500,000 pesos. 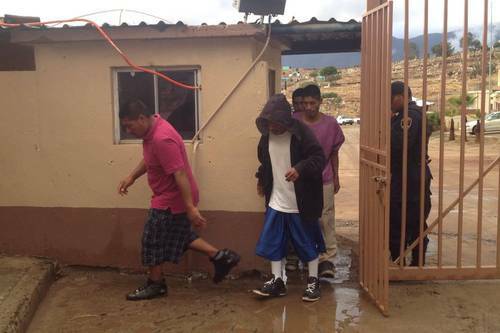 Those last 14 workers were released from prison in Ensenada on May 16, amid what seems to be an unusual agreement. Among the points of an apparent agreement of 13 points, were an agreement that the workers would return to the fields until processes could be developed and talks resumed June 4 regarding the terms of a pay scale that would be retroactive to May 24; an agreement that the growers would present a proposal “as close as possible” to the 200 pesos/day, and that the Federal Government would make up the difference, according to reporting by La Jornada on May 14. In an unsurprising twist, however, the San Quintín growers have disavowed the proposal presided over by David Garay, representing the state and federal governments, and agreed to on May 14 by both government and worker representatives. Despite the expectation that the government representatives were also representing the interests of the growers, the growers said May 16 that Alberto Muñoz, legal representative of the growers at the negotiations, attended “unicamente para conocer lo que ahí se trataba, pero sin facultades para acordar o negociar,” according to La Jornada – that is, only to be aware of how the negotiations were proceeding, but without any power to negotiate or make any agreements. In light of this statement, the additional statement by the growers that “no habrá variación en esa postura ni en el porcentaje,” that is to say, that there was no change in their position of the percentage pay increase of their offer from that initial offering of fifteen percent from May 27, is not unexpected. 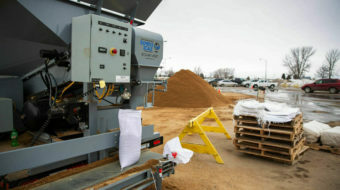 That is- that they are looking forward to the Federal Government showing them the mechanisms and processes by which they plan to provide the resources, presumably expecting that the resources are to be provided to the growers, in order to cover the difference in the pay for the workers in order to satisfy them so that they will return to the fields… as indicated in the agreement.